Puerto Peñasco, like much of the northwestern coast of Mexico still reeling from a decline in the fishing industry, is getting a makeover. The city, 60 miles south of Mexico's border with Arizona, is increasingly better known for its designer golf courses than for the 850 tons of shrimp it pulled into its harbors last year. But as investors pour millions of dollars into luxury vacation developments, many worry that the rush to cash in on tourism could destroy the unique desert-marine environment — think, coyotes hunting crabs — that draw more than 1.6 million visitors annually. "Sometimes because we're so desperate we don't think of the future, of preserving what we have," said Fernando Garcia Pacheco, one of 11 councilmen who govern one of the fastest-growing tourist destinations in Mexico. "We're still dealing with the effects of having ravaged our fisheries," said Pacheco, looking at the city's downtown pier where shrimp trawlers bob in the water near recreational boats. "And now we're inviting developers to bury estuaries where marine species reproduce. It doesn't make sense." In the past five years tourism has outperformed fishing as the strongest industry in Puerto Peñasco, bringing more than half a billion dollars in private investment last year to a city where most streets remain unpaved. Pacheco's concerns resonate little among municipal officials who see multimillion-dollar developments as central to the city's success. "Nature and development can coexist," said Hildegardo Hernandez Castro, secretary of the Puerto Peñasco city council. "Environmental impact statements ensure that these developments don't hurt the environment." But environmentalists say the statements, prepared by private consultants and submitted to Mexico's environmental regulating authority, SEMARNAT, frequently violate the spirit and letter of Mexican environmental laws, allowing developers to sell condos faster than they can build them. The lack of enforcement is ushering in a tourism model that will ultimately do more harm than good for Mexico, according to Sandra Guido, executive director of the Alliance for the Sustainability of the Northwest Mexican Coast (A.L.C.O.S.T.A. ), a coalition of environmental non-profits in the region. "If you take a picture of a resort in Puerto Peñasco, you'll find the same irrational combination of marina, golf course, and condominiums in Mazatlan, Los Cabos, Nayarit," said Guido. "It's copy and paste. It doesn't matter if the places have water treatment plants or not, if there are unique species in the area that need to be conserved, or what the cultural practices are. It's a race to offer a product to a public that doesn't know better." In the first half of this year Mexico took in more than 11 million international tourists who left behind $6.8 billion, up 9 percent from the same period last year, points out Victor Hugo Castañeda Soto, director of communications for the Secretary of Tourism. "Tourism is a real influence on economic development and generation of jobs and well being of communities," said Castañeda. "By 2025 tourism activity could generate as much currency as the energy sector." Maria Isabel Cervantes said she worries that an authorized residential tourism development could contaminate the oysters she cultivates in the Morua Estuary, a 10-mile-long (16-kilometer) hypersaline lagoon in Puerto Peñasco where more than 100 species of birds nest or pass through on their way up the Pacific flyway, a migratory avian route spanning the length of North and South America. Cervantes has worked as part of Cooperativa Unica de Mujeres del Mar for the past 26 years, one of four oyster-farming cooperatives that operate out of the Morua Estuary. Opposite the one-room restaurant where she and her coworkers alternate featuring their oysters every week, Arizona-based developer Canusa Homes has plans to build The Pointe de Las Conchas — five luxury high-rise condominium towers, six swimming pools, a putting green, and 30 beach houses — on a strip of land between the mouth of the estuary and the beach. "We're hoping the construction won't disturb them but oysters are very sensitive," said Cervantes, pouring water over crates of oysters in the estuary at low tide. "I really enjoy this kind of work. It can be hard but it's better than being enclosed all day working in a room for someone else." Conservation groups are challenging the legality of the project, charging it will disrupt natural water channels and destroy a colony of least terns, a federally-protected species of small black and white sea birds said to fly so quickly their wing beats can't be counted. "Developers basically said there is no colony of least terns in the estuary and that just in case there is, they won't bother it," said Alejandro Castillo Lopez, assistant director of the Intercultural Center for Study of Deserts and Oceans (C.E.D.O. ), a non-profit biological field station in Puerto Peñasco. "It's unbelievable, really." John Alty, sales manager of The Pointe de Las Conchas, declined to discuss the project as it relates to the environment. Complicating efforts to stop developments thought to be illegal are Mexican judicial procedures that require plaintiffs to provide the court with enough money to cover losses the project's owner faces from suspending construction, according to Jose Pablo Uribe Malagamba from the Mexican Environmental Law Center. "It's practically impossible for members of the community to come up with enough money to challenge a large development that threatens the environment," said Uribe. Last month Ricardo Juarez Palacios, SEMARNAT's director of environmental impact and risk for the past six years, resigned amid allegations that his department regularly authorized projects that contravened environmental law. Congressman Diego Cobo Terrazas presented the Secretary of Public Function (S.F.P. ), in charge of investigating government corruption, with a list of 73 "irregular" authorizations under Juarez' leadership, including at least five in Puerto Peñasco. The S.F.P. is in the process of investigating six complaints against Juarez, including approval of a tourism development in Cancun that would destroy 932 acres (377 hectares) of mangrove forest set aside for conservation. Last year A.L.C.O.S.T.A. identified more than three-dozen estuaries or wetlands along the northwestern littoral at risk of destruction due to development. In Puerto Peñasco, the national Mexican development group, Grupo Vidafel, has already disrupted natural water channels by building the hotel resort Mayan Palace over half of La Pinta Estuary, according to Castillo. Mayan Palace didn't respond to numerous phone calls seeking comment. Castillo said besides providing a home and breeding ground to a number of endemic species, estuaries help mitigate flooding. "If you block an estuary's water channels, the water will find somewhere else to go," he said. "It's kind of like what happened in New Orleans." After initial rejection by SEMARNAT, the Arizona development group Sandy Beach Resorts Realty won authorization last year to build two marinas in La Choya Bay in Puerto Peñasco. Castillo said the project will destroy rocky reef habitat where protected invertebrate species live and disrupt natural sediment and current patterns in La Choya Estuary. Almer Elzink, marketing director of Sandy Beach Resorts Realty, said the marina poses no threat to the estuary or the environment. "The marina doesn't affect flora or fauna. We have all the necessary licenses to build the marina on our property," he said. "There's huge demand for boating and we're answering that demand by building a state-of-the-art marina. It's going to be a big job generator and big attraction in the town." Projects like the vacation homes Sandy Beach Resorts Realty offers in La Choya Bay, which its Web site calls the largest American subdivision in Mexico, are fueling a debate about what kind of tourism Mexico should court. "We're not saying no to tourism," said Castillo. "We're just saying let's get the best quality of tourism we can get. The assumption is that the more tourists come here every year, the better off we are. But that's just not true." According to a recent study on tourism in the northwest region of Mexico by the non-profit research organization, the Mexican Institute for Competitiveness (I.M.C.O. ), for every dollar of tourism-related investment Mexico brings in, federal and state governments spend $2-$6 to attract it. "Mexican authorities are not taking into account all the externalities in the area," said Francisco Fernandez Castillo, director of the I.M.C.O. study. "And the main attraction in the region-the environment and wilderness-is not being protected. This growth is not sustainable." According to Puerto Peñasco's tourism and urban development plan, growth in the hotel industry has leveled out while growth of residential tourism is still strong. Fernandez said retirement and second homes create fewer permanent jobs and fewer incentives for developers to think beyond short-term profits. "If you build a hotel you have to invest in making it profitable in the long term," said Fernandez. "If you're building condos you can sell them before you get permission to build and you don't have to worry about what happens afterward." Elznik said Sandy Beach Resorts is a positive force in Puerto Peñasco, donating money and land to community projects and employing up to 1,000 people. "Five years ago, people were crossing the border to find a successful future," he said. "Now they can work here." A $1.9 billion national tourism venture sparked the current real estate boom in 2001. Initially named "Escalera Nautica," and reportedly called the "stairway to prosperity" by former president Vicente Fox, the plan envisioned coastal communities from Sinaloa to Baja California as a series of steps from which recreational boaters could sail port to port. Having overestimated demand, Mexico has since renamed and scaled back the project but real estate development in the proposed destinations continues unabated, drawing on investment money from Americans to the north and cheap labor from job seekers to the south. After hopping off a freight train passing through central Puerto Peñasco, Juan Atienzo said he isn't sure yet where he'll sleep but has no doubt he'll find work. "There are a lot of jobs on the coast now," he said. "Of course, I'd rather work at home where my wife and kids are, but like everyone else, I'm looking for a better life." Atienzo said he makes about $20 a day working in construction on the beaches of Puerto Peñasco, twice what he can make in his hometown of Empalme, Sonora and more than four times the daily minimum wage for Puerto Peñasco. It's his fourth time here and said he also works in construction for months at a time further along the coast in Cabo San Lucas and San Carlos. Secretary Castro said Puerto Peñasco is one of the fastest-growing cities in Mexico. He estimated the current population to be about 75, 000, almost double what the Mexican census reported for 2001, and said the city expects to absorb another 50,000 people in the next five years. Fernandez said rapid population growth and high impact developments are overwhelming municipal public services all along the coast. "Municipal authorities believe that success comes from building luxury hotels and bringing in investment so they give a lot of concessions without thinking about how to support it," said Fernandez, who found that the three-year term limits Mexico imposes on municipal governments discourages long term planning. "They ignore the real problems and expect the next administration to take care of it." Puerto Peñasco and other coastal cities have overexploited the region's aquifers, leading some to wonder how future plans for growth can be sustained in one of the driest regions in the country. "We need to be sensitive about the desert environment this growth is taking place in," said Castillo of C.E.D.O. "Should we really be planning to build more golf courses?" Puerto Peñasco consumes three times as much water per person as it should, said Gerardo Figueroa Zazueta, director of the municipal water agency. The city is planning to contract a private company to build a desalinization plant before 2009 when the current administration leaves, he said. In the meantime, while private resorts rely on reserve cisterns or private desalinization plants for a steady flow of water, parts of the rest of the city suffer from water shortages, low water pressure, and at times, no water at all. "Peñasco is growing very nicely in some parts of town and in other parts, very disorderly," said Figueroa. "About 90 percent of the city usually has water service most of the time. And we're working on getting water to the remaining 10 percent. In the meantime, a truck distributes water in barrels to them." Rosalva de Jesus Flores and her family moved to Puerto Peñasco from the central Mexican state of Puebla one year ago. "You move because you expect to improve your life, to create a better future, not to end up in the same situation," she said, standing in the sand in front of the home she and her husband crafted out of scrap wood and metal. 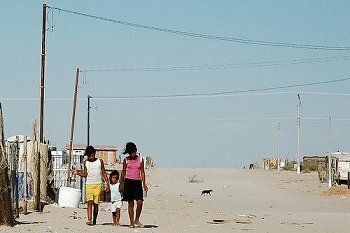 De Jesus and her mother and daughter are one of about 4,500 families that councilman Pacheco estimated live in squatter settlements stretching for miles along Puerto Peñasco's outskirts, without running water, electricity, or plumbing. "Here life is very cruel," said de Jesus. "Everything is very expensive here. My husband used to make 1,000 pesos a week but here you can't rent a house for less than 3,000 pesos per month. We couldn't afford to rent a house and eat." Her 20-year-old husband worked in construction at a nearby resort until he died suddenly of a heart attack in their home in March. Seven months pregnant and recently widowed, de Jesus said she will probably get a job in housekeeping at one of the resorts after she gives birth. Her most immediate concerns, she said, are the snakes and scorpions that she and her neighbors struggle to keep out of their houses. "Last night when we were sleeping a snake got into the house. I was terrified but what could I do? I got a stick and took it out." Guido said communities around the Sea of Cortez are becoming "islands of luxury in seas of poverty" that typical of tourism destinations in developing countries. The intensity of development on the coast, she said, would have been impossible without President Carlos Salinas de Gortari's constitutional reform in 1991 allowing for the privatization of ejidos, communal land that was protected by the state beginning in the 1930's. Maria Luz Cruz-Torres, an Arizona State University anthropology professor who has researched coastal communities in Mexico, said that as government support for farmers and fisherman dries up, ejido members increasingly find themselves selling their titles to investors. "On the coast almost all of the ejidos have been sold," she said. "And most have turned into tourism developments." A Baja California Sur senator wants to reform the constitution further by removing a restriction on direct foreign ownership of Mexican coastal land. Senator Luis Alberto Coppola Joffroy, who directs the hotel chain Grupo Coppola, is introducing legislation this month that will allow foreigners to directly own land within 31 miles of Mexico's coasts instead of through a Mexican real estate trust as they do now. While both supporters and critics of the legislation say the reform will strengthen foreign investment along the coast, they disagree on whether it will be good or bad for Mexican communities. "Sometimes I feel like a foreigner in my own country," said Jose Ybarra Solis, a gas station attendant and long-time resident of Puerto Peñasco. "On the one hand all this tourism is good for the people because it creates jobs but it has its negative side too. The Sea of Cortez doesn't feel like ours anymore. We can't go to the beach like we used to and seafood has gotten too expensive to eat." Earlier this summer 60 people protested the lack of public access to beaches in Puerto Peñasco, ending in seven arrests after protestors tore down a fence on property owned by Americans. While beaches are federal zones in Mexico and cannot be privatized, side-by-side gated private resorts effectively block people who aren't residents or guests from a long stretch of Puerto Peñasco's beaches, where visitors get pedicures, ride jet skis, and swim in warm clear waters. "Local communities are still waiting to see how they're going to be integrated," said Torres-Cruz. "Everything is controlled by the tourism industry. It's a very top-down approach." In May, Secretary of Tourism Rodolfo Elizondo Torres made public comments about the need to support sustainable and orderly development that works in Mexico's interests, giving hope to supporters of localized eco-friendly tourism. Castañeda said the Secretary of Tourism and 13 other federal agencies signed an interinstitutional agreement a few days ago that will strengthen conservation efforts and rural and indigenous community development through the promotion of ecotourism. "We have to think more and more integrally about tourism, not just a strategic instrument of economic policy in Mexico but also as an instrument of social policy," said Castañeda. Such talk builds on environmentalists' victory in February, when the newly-elected President Felipe de Jesus Calderon Hinojosa approved legislation putting coastal mangroves off-limits to development. Guido said the law protects mangrove swamps that Gulf of California fisheries depend on and eases fears that rapid development around the Sea of Cortez will permanently damage the fourth most biologically diverse region in the world. "We've got to leave something to future generations," said Guido. "I don't think we have the right as a society to transform a coastal lagoon into a marina or golf course or to decide that people in the region will only be able to work in tourism in the future." In the meantime Puerto Peñasco is opening itself to visitors via land, sea, and air. Castro said the state's construction of a 375-mile $30 million coastal highway will cut hours of driving time from California along the Sonoran coast is nearing completion. The city is also building a new marina and this month expects to finish a $50 million international airport in time to receive Arnold Schwarzengger and other governors of U.S.-Mexico border states in September for the annual Border Governor's Convention at Las Palomas Seaside Golf Community. "Development is very strong right now," said Castro. "It's a good moment to invest in Puerto Peñasco."